Much has happened since the last post. I purchased A Harbour Banana Model off Craigslist. It’s a 9’6″. I’ve surfed it over the last three days and have caught 35 waves total. 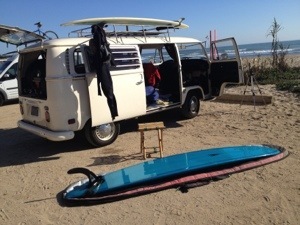 I’ve surfed the past 3 days at Bolsa. Surfed the Palaoa and caught 12 waves one day, 12 waves the second day, and 6 waves today. I was surfing with my brother today and we switched boards. I surfed 8 waves on his 9’3″ Harbour Banana. So fun! I liked it so much that I hope to create one soon. Easy to catch waves, trimmed well. My total wave count on the Palaoa is 73 waves. Anyone wanna trade a Banana for a Palaoa? 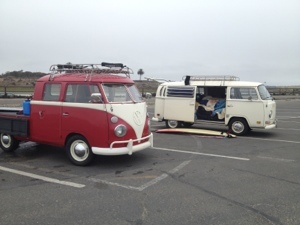 My brothers bus, and my bus. 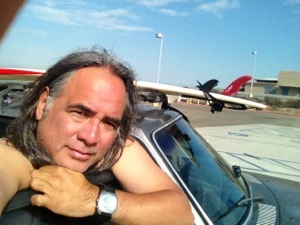 I surfed yesterday I Bolsa Chica on the Palaoa. I caught five waves. I surfed today and caught five more waves. My total wave count on this board is 49 waves. I absolutely love this time of year. It’s like I have my own private beach. It’s after Labor Day and everyone has gone back to school are back to wherever. From Labor day through Thanksgiving is always such a great time of year to surf in Southern California. I love it.